There’s something humorous and inspiring with social media statuses. Passing the time while you laugh, cry, get inspired, or share other people’s feelings is easy when you get the best of what they share right up on social media. If you’re just looking for such an app, then look no more. Right now, the Best WeChat Status & Quotes app is now available on Android and it might just be the app you’ll need on your phone. The Best WeChat Status & Quotes is a quotes app developed by App Appa for entertainment purposes. This was recently released and hit the market just this September 25, 2015 and is available for download on Adroid devices with 3.0 versions and up on Google Play. The main purpose of the app is to provide entertainment by providing users with thousands of amazing and hilarious status and quotes to choose from. 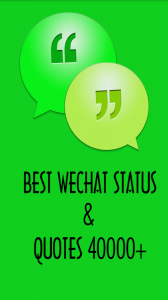 Best WeChat Status & Quotes have all the basic features users need to get their social media status fun and quirky. • Thousands of quotes and status available – with more than 40,000+ of quotes and status to choose from, users will never run out of things to post on their social media account. • Organized categories – users will not worry about sorting thousands of quotes and status and see which one would suit them best as the app has 40 categories organized. • Trending analysis – whether users are interested with the hottest quotes or status out there or they simply want to be updated, the app has a trending analysis going so the hottest and latest social media updates and status reaches them. • It’s totally free – users will definitely love the Best WeChatap: it’s fun, it’s cool, and it’s totally free! Overall, the Best WeChat Status & Quotes app is a practical phone app, especially if you always want to get updated on what’s going on with social media. It’s also very easy to use given its user-friendly interface so using it even for the first time is no hardship. Also, it allows sharing favorite quotes and status on different social media channels very easy. 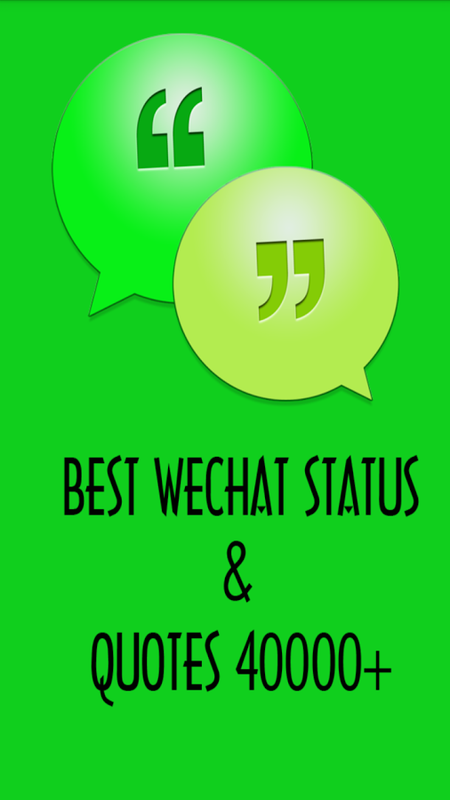 When it comes to delivering the most updated status and quotes, the Best WeChat app definitely delivers. It’s also very helpful when users want to post a status according to their mood because it has plenty of categories that cover every mood and occasion there is like attitudes, breakups, crushes, anniversaries, friendship, funny things, etc. Compared to other apps like it, Best WeChat app would be an app worth trying. Why not? It’s fun and cool and it’s definitely free so what’s not to like with it?